Birth Timeline for those interested in the story! Thursday morning I lost what’s called a plug. This doesn’t mean a whole lot, necessarily, but usually means hours or days once term. Thursday afternoon/evening I had some random uncomfortable contractions, but nothing that made me have to stop and focus. 11:30pm I woke up with some more consistent contractions, but was able to go back to sleep through them. Friday 1:30am I woke up with consistent contractions 10-12 apart that were strong enough I couldn’t sleep through them, but I still rested in bed between them. Friday 5:00am I got up when Chad did and contractions had become closer together, averaging 4.5 minutes apart and averaging 30-40 seconds in length. I continued to labor at home with the same average and length for the morning. Just before 11am my water broke. I was talking to a doula friend and also called Chad to have him come on home, but since contractions hadn’t changed I wasn’t in a huge rush yet…. Chad came home about 11:20 and by then contractions had picked up to 2-3 apart and were getting stronger. I rushed Chad and myself out the door and mom headed to take Ella to a friend’s and then come to the hospital to take pictures. As we drove the 20-25 minute drive, contractions continued to become stronger and longer. By the time we were walking in, I had three more that about brought me to tears. I know I was sobbing in a way, just no tears. We got to the L&D ward and they started to send me to triage until they saw me have a contraction. They quickly moved me straight to a room and had me change. They then started to prep to make sure my water had broken and check my progress, but by the time I was strapped to monitors, they could see that I was in fact losing amniotic fluid. She quickly checked my progress and put me at an 8-9. She asked if I was feeling the need to push and I said no. During the next contraction, I rolled to my side. Chad says they were asking about epidural, but I don’t remember any of that. Good thing I didn’t plan on one because there wasn’t time… I did apparently have that moment where I said that I wasn’t sure I could do this. The nurse and tech went to get the doctor and I got up on my knees facing the back of the bed which was reclined up. By then the contractions were almost unbearable and by the second one, I did in fact feel the need to push. I remember I kept saying I was pushing and couldn’t stop it. This is when Chad grabbed the camera. I wasn’t even sure who was in the room or if the doctor was there yet. I felt my body bear down. I literally couldn’t stop it! Three pushes later I saw and felt a gush, followed by another and feeling baby’s head and then another and the body. Apparently the head was about out before the doctor walked over to catch. She caught the baby and, according to Chad wasn’t sure how to hand her to me, so she hesitated and then passed her under me and laid her on the bed where I picked her up. I heard someone say “him” and asked if it was a boy. Chad saw first and corrected us all that she was a girl! From the time I checked in to the time she was born was only about 20 minutes. They only got 9 minutes of tape on me and baby, also! I pushed maybe 5-10 minutes! 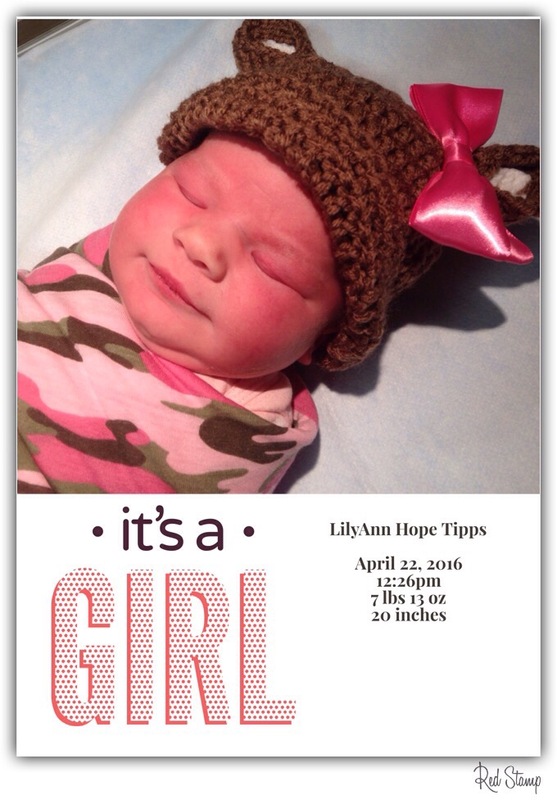 And that’s how our LilyAnn Hope came into this world!